July 4th is Dear Husband (DH) and I's anniversary! This is great because it means it will always be a public holiday as long as I sitll live here in the US lol. We decided to go somewhere neither of us have never been! Toronto Canada! This is what I wore! Casual outfit. 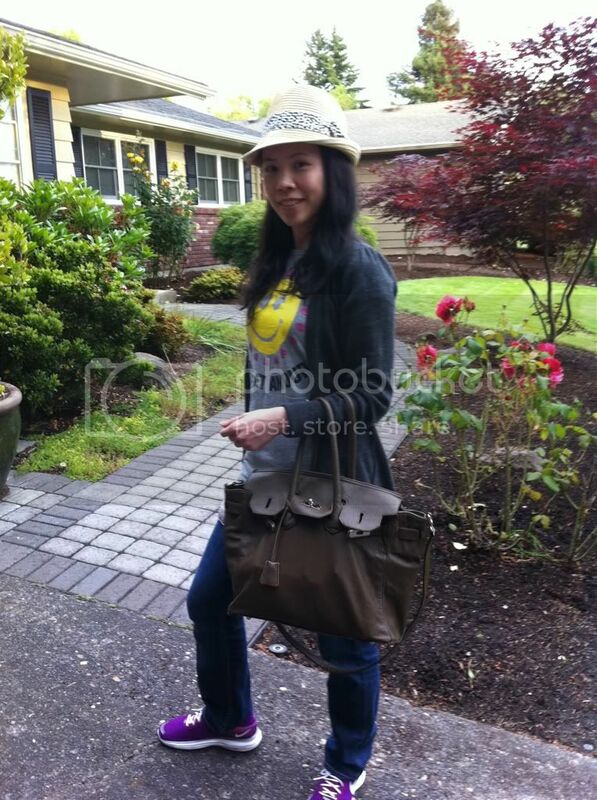 Hat is from H&M, and bag is Marco Tagliaferri that I got from HgBags. This is the medium size in the colour Mud with silver hw. Day one, we flew red eye to Detroit. My uncle recently moved to Windsor Canada, 35min drive from Detroit. We took a quick nap and then went to the outlet mall across the street with my 3 little cousins! I was wearing Rebecca Minkoff Morning After Clutch in Tangerine colur I got from Luna Boston. In the afternoon, we decided to take a ride in the nearby park, breath in some fresh Canadian air! We were exhuasted after the first day but the fun had just begun! More pictures to come tomorrow! !